"We are dying, but will be reborn." It is my own personal opinion that the subject of African slavery has never really gotten its due on film. While projects such as Roots and Amistad are generally considered some of the final words on the subject, I personally feel it's a topic still waiting to get the right treatment. 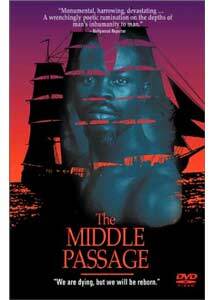 The Middle Passage is many, many steps closer to a satisfying film treatment of this period in history than anything I have ever before witnessed. While not a dramatic film in the strictest sense of the word, this artistic and poetic project is an extraordinary achievement, honoring the lives lost during this dark time, as well as honoring the very notion of the will to fight against an oppression and win even a minor victory. Middle Passage is narrated by an anonymous, African voice (played by Djimon Hounsou), which tells the story of how Africans are taken from their homelands and then packed into slave ships for transport through the Middle Passage, the infamous "triangle trade" shipping route that traded spices, gems, and people. The route itself was one of the furthest journeys on the sea at that time and was so agonizingly long and brutal that it killed millions of captives, not to mention countless crew members. Worse yet was the fact that many these Africans were sold into this nightmare by their own rulers who were corrupted by foreign money and power; in this case, they were sold by the King of Dahomey. It is not a strict narrative, but rather a visual poem told with varied images and scenes; while there is linear, coherent structure, it is not a conventional film in any sense. The end result of this film technique is a look at the slave trade that vastly conquers all others seen on film, as it doesn't let specific characters take over the story, nor does it feature the slavers themselves in any significant role. Rather, it is a film that seems designed to highlight the emotions and frozen-in-time experiences these slaves may have indeed had. Of course, it's impossible to ever approach those feelings in a true sense (we have no idea what it's like to actually be there), but you can create a convincing atmosphere, and Middle Passage brilliantly achieves this while still being a tremendous artistic experience. With almost no dialogue or scenes much more elaborate than small-space settings, the impression of the claustrophobia and horror of the slave ship is easily achieved and used in a way that properly gets across the message. Like a dark fireside story, Middle Passage is a tale that is told in quiet voice, in a somber mood. It is an unspeakable event that, ironically, must be spoken of in order to teach and teaching seems to be the ultimate goal. Perhaps what most pleased was the fact that this "animated narrative" does not include true characters or, above all else, slaver characters that the audience would be expected to identify with. The story remains, almost entirely, in the hands of the slaves themselves and it is with them that it ends. It ends, however, with a faint glimmer of hope and the knowledge, in retrospect, that while so many African generations would be crushed under the weight of slavery, future generations would go on to revolutionize the world. Image Transfer Review: Despite some source problems (a few speckles and such), this is an extremely solid transfer with superb detail in many of its more complex scenes. Shifting from daytime cinematography to the dark, oppressive, and dismal scenes within a slave ship, the photography is always well rendered with sharp blacks and beautiful colors. There is tremendous personal detail in close-up sequences, and one can easily appreciate the artistry of the shoot. Some grain pops up here and there, but this is a very impressive look at such a distinct set of images. Audio Transfer Review: The stereo surround soundtrack is equally impressive as the video, mainly for its subtle and effective surround channel usage. Many scenes are just dialogue, but the soundstage, with its multiple effects, sets the mood quite well. The most chilling example of which is the in-ship audio in which subtle ocean waves, chains clinking, and the sound of human breathing is well expanded into an all-speaker experience. It is a good mix that fits the film well, despite a slight drop in activity during outdoor sequences. Oddly, while this release includes a Spanish audio track, the disc lacks the original French track, the language in which it was originally filmed. Extras Review: There are no extras on this disc. The presentation is basic, but very functional and with little to complain about. Powerful and though-provoking, Middle Passage is a must-see, really. It is an artistic realization of an stunning horror in which, ironically enough, director Guy Deslauriers manages to transform into filmmaking beauty. A piece of time transformed into a living memory, this film easily earns its acclaim.